The entire point of purchasing a security suite is so you know it has your back. You want it to be assured the company has invested heavily in development to make sure it can counter the latest threats. German-based independent security institute AV-Test regularly tests the latest security suites, pushing them through a range of measures including performance against the latest threats, plus how they impact your system. You don’t want a security suite to slow your PC. The latest October 2018 report displays some interesting results. From our experience, and regular comments we read on our own posts, Malwarebytes is an American-developed security tool which can do almost no wrong, yet its performance in the October 2018 results are borderline shocking. 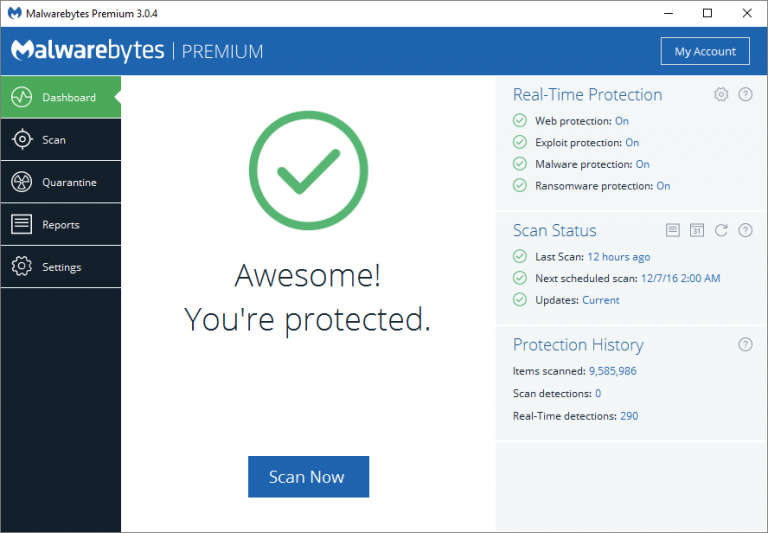 Indeed, we’re not talking about Malwarebytes Free either, this is the paid Premium edition. Malwarebytes has just been found to offer the worst protection against the latest security threats, compared to a range of other security suites from regular brands such as Norton, Kaspersky, AVG, Bidefender, Avast and somewhat lesser known solutions such as eScan, G-Data and Ahnlab. Worryingly, Malwarebytes performed less effectively than Windows Defender, which is built-in to Windows 10 and turned on by default. It also came below the likes of Avast Free, which you could install alongside Windows Defender. If you want to go through the results yourself, in detail, read the AV-Test October 2018 report. As to how other suites did in the tests, Kaspersky Internet Security 2019 (v19) was up at the top, as is Bitdefender Internet Security 2019 (v23). Avira Antivirus Pro v15 performed admirably, as did Norton Security 2019 (v22). eScan Internet Security v14, which few people we know would recommend, was also one of the strongest performers, offering 100 percent protection against 0-day malware attacks, detection of the latest malware (all available in the last 4 weeks), with limited slowdown on the test PCs, whilst offering 0 false website warnings and 0 false detections of legitimate software through October 2018. Comparing these results, Malwarebytes Premium delivered 97.2 percent protection against the latest 0-day threats, a 40 percent slowdown when accessing frequently-used apps and 4 incorrect detections of legitimate software as malware (13 in September) through October 2018. The AV-Test October 2018 report is publicly available now.